“We read and were inspired by the Blueprints from Totnes and elsewhere”, she told me, “but as we got into the process found that we used the platform for going our own way. Unlike some initiatives who raised funds and gathered together lots of local partners before going ahead, we did it the other way round, and did the study and presented the findings so that we might then use the evidence to convene even more people and groups in taking positive actions”. “Our MP, local authority and university were very helpful in providing data. We also did some local survey work which we’d like to repeat annually. It has already proved a catalyst: following the launch, a new group has formed to explore well-being in our community (Inner Transition), and the Civic Association who were already thinking about renewables for their visitors’ centre are keen to undertake a full feasibility study for their own property, but also to support the potential for a community energy project, and more”. The introduction of renewable energy generation into just 35 houses in Buxton each year would contribute afurther £250,000 to local businesses per annum and benefit householders through savings and income by £65,000 a year. In addition a community renewable energy hydro project could generate £35,000 p.a. through the feed-in-tariff and generate enough electricity for 50 homes. Like many towns, Buxton has lots of older buildings but the study revealed that many of the tradesmen who claim they know how to suitably insulate them don’t really understand. The Economic Resilience study has provided evidence to support the local college who are launching a building skills training centre (to include retrofitting) to secure funding from the Local Enterprise Partnership. The report was well received. 33 people ventured out on a snowy night to hear about it. According to Jean, The Director of Local Economic Development at the borough council came to the launch and stayed until the end, engaging in discussion and debate about the report’s implications. Many of those who came were, as Jean put it, “people of substance”, people who have influence in the town, such as the Director of the local Opera House, several Councillors, Chair of the Town Team, and local press. The next day she had a thank-you email from a local businessman and developer saying he had read the report “cover to cover” and declaring it ‘a very important initiative’. “It’s out there now”, Jean told me. One local Councillor wants to use the report’s findings to help combat a new supermarket being proposed for the town. “Creating this report has also given our Transition group new energy. It has brought in new members and has increased our reputation and respect for what we do”. “The figure of only 1% of money spent on food being spent in local independent businesses shocked people”, Jean told me. “Four years ago the figure was 10%. We have seen high retail business rates and large multiples pushing several independent businesses out, resulting in reduced choice and missed opportunities”. Transition Buxton already work with their local Town Team, who bidding to take over a rather moribund twice weekly market and give it a makeover. The study supports the revitalisation of the market to offer trading opportunities for local suppliers and increase access to local products for residents and visitors. Transition Buxton has also been very busy with the Serpentine Project, which is taking over an old Council plant nursery to turn it into a market garden and educational project. The site was a mess, home to many weeds but also to over 10,000 old plastic plant pots. It is a project that has interested the whole town and attracted dozens of hardy volunteers to spend hundreds of hours clearing the site. Muscle power has also come from public service students at the local college (28 had turned up a few days before we spoke). Plans include a polytunnel and raised beds, to produce food, and working with catering students to teach and learn about using and preserving local seasonal produce. You can read more about that here. 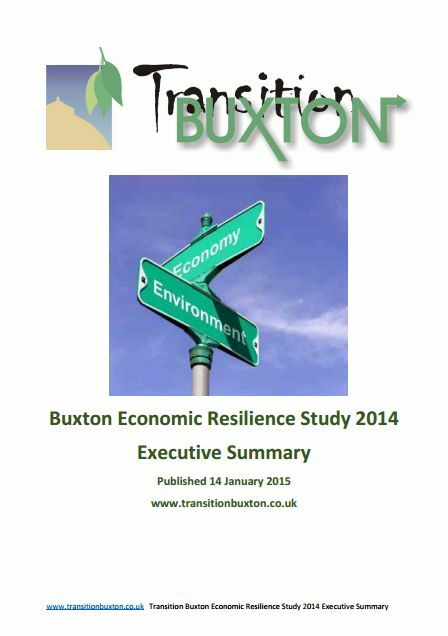 Please download, read, share and use the data in the Buxton Economic Resilience Study report and appendices, all freely available on Transition Buxton’s website here.